To correct transmission problems in your vehicle, the technicians at AAMCO undertake a thorough, top-to-bottom diagnosis before attempting any repairs. Our multi-point transmission scan service involves a comprehensive examination of all your vehicle’s systems. We start by checking your transmission fluid, because shifting problems are often caused by low levels or dirty fluid. If needed, we also check your case and differential fluids. Then, we take your vehicle out for a road test, so we can notice any transmission problems you have been experiencing. During the drive, we make notes of how your car engages, how it feels and sounds when driving in each gear, when the transmission shifts, and how smooth those upshifts and downshifts are. We also do a complete check of less commonly used gears, including reverse, neutral, and even park. After the test drive, we put your car on a lift and inspect the undercarriage. Sometimes, problems that seem to be transmission or shifting issues may have other causes, such as frayed or broken cables, faulty vacuum connections, missing or broken gaskets, worn out joints, or fluid leaks. A visual exam will reveal any of these problems. If the physical inspection doesn’t reveal the cause of your vehicle’s symptoms, your AAMCO technician will perform further diagnostics before recommending any course of action; this ensures that we don’t charge you anything extra by performing unnecessary service or repairs. As a valued customer, we treat your vehicle with the utmost care and courtesy. Vehicles today consist of more than just engines and mechanical components. Most feature sophisticated on-board computers that control multiple systems, including the transmission, powertrain, stereo, lights, steering, and power locks and windows. Some transmission problems originate in your vehicle’s computer, so AAMCO uses computer diagnostics to see if bad wiring, circuitry, or programming are causing your car’s performance issues. Our computer scanners interpret your vehicle’s trouble codes, and lead us to possible causes of problems. 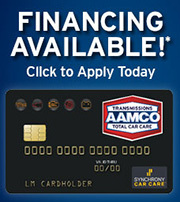 AAMCO’s database, compiled over decades of experience from repairs we have performed at our many locations across the nation, is a comprehensive collection of computer diagnostic information. Together with our Kwiktest™ PlusBox, we use our database to identify the source of your transmission difficulties. After running computer diagnostics, your AAMCO technician will inspect all wiring, sensors, solenoids, and other electronic components on your vehicle to make sure they are working properly. Our thoroughness and meticulous attention to diagnostic detail help us to provide the best customer service and quickest repair times so you will soon be able to get behind the wheel of your fully functional vehicle once again. Most vehicles only require minor repairs, not full transmission rebuilds. AAMCO’s extensive diagnostic process ensures that we have exhausted all other possibilities before we offer to rebuild your transmission. With almost 50 years worth of experience across the nation, we are experts in transmission problem diagnosis and repair. When we do need to fix or reconstruct a vehicle’s transmission, we use only the best available parts, and provide only the highest quality workmanship. We have so much confidence in our technicians’ training and expertise that we offer an unbeatable warranty on both parts and labor, with an optional lifetime warranty available at an affordable price point. A visit to AAMCO will never include unnecessary service or repairs, because our thorough diagnoses precisely identify the causes of your vehicle’s issues.